Dr. Heidi Hutner, Director and Producer, is a professor of Sustainability and English at Stony Brook University, and a scholar of nuclear and environmental history and ecofeminism. She is the winner of Sierra Club Long Island's 2015 Environmentalist of the Year Award. At Stony Brook University, she teaches courses on the environmental literature, history, and film. She chaired the Sustainability Studies Program for six years and was Associate Dean in the School of Marine and Atmospheric Science. Hutner publishes widely as a writer and journalist on nuclear, environmental and gender issues. She regularly gives public and keynote talks at universities and conferences on environmental studies and ecofeminism. Her current book project, ACCIDENTS CAN HAPPEN: VOICES OF WOMEN AND NUCLEAR DISASTERS, will accompany the documentary and forms the basis of the film series. Hutner's many books, book chapters, and essays have been published by Oxford University Press, University of Virginia Press, Palgrave Press, Rowman and Littlefield Press, Broadview Press, among others. As a journalist, she writes for the New York Times, Ms. Magazine, Public Radio International, DAME, Spirituality and Health, Mom's Clean Air Force, Yes!, Tikkun, and more. Hutner produces the popular web video show, Coffee with Hx2, in which she interviews world experts, Nobel Peace Prize winners, McArthur Genius Fellows, and other luminaries on sustainability and environmental issues. She recently appeared on the NBC News Think episode, “Clean Water is a Human Right” and gave a Tedx on "Eco-Grief and Ecofeminism." Hutner was the associate producer of the off-Broadway climate-change musical, Endangered. For more about Heidi Hutner (and full list of her projects/publications), see her website: HeidiHutner.com. 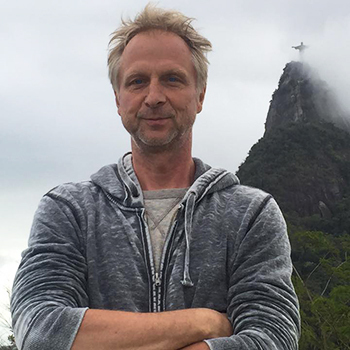 Martijn Hart, Director and Director of Photography, has worked in film and video for over thirty years in the United States, South and Central America, Canada, Australia, Asia, and Europe. He began his career as cameraman and director in Rotterdam, Netherlands, for Stads TV. After moving to New York City in 1996, Hart worked as a freelance cameraman, DP, and director for BBC (UK), ARD, RTL (Germany), Canal +, Arte (France/Germany), VTM, VRT (Belgium), NOS, NTR, RTL (Netherlands), RTF (Switzerland), TV 2 (Norway), Al Jazeera and Vice News (United States), among many others. Hart is the co-creator and director of “Nova New York,” a weekly series from New York City for Dutch TV, which followed the 2004 and 2008 American elections. His documentary Directing/DP credits include The Brooklyn Connection (funded in part by Frontline-PBS, and 60 Minutes), which investigates the American connection to arms traffic from the US to Kosovo; and Saxman, which chronicles the life of legendary saxophone player Piet le Blanc from Rotterdam, Netherlands. Hart’s filmography has been shown at The Rotterdam Film Festival, Tribeca Film Festival, IDFA Film festival Amsterdam, and festivals throughout Europe. Hart also films art, dance, and theatre performances in New York City and collaborates on film components for theatrical events. Freke Vuijst, Associate Producer, has written, directed and produced over twenty documentary films, which were shown by public broadcasters in Europe and the U.S. and selected for film festivals all over the world. Many of her films received awards: Paul Robeson Award (Keep on Walking), World Hunger Media Award (Consuming Hunger), Gold Medal-New York Expo (The Last Dance). She has covered a wide range of subjects in her documentaries, from immigration, to youth culture, to religion and politics. As a journalist, she has reported about America for Dutch media – print, radio and television – for almost forty years. She was twice nominated for De Tegel, the Dutch equivalent of the Pulitzer Prize. She has also written for American publications, notably The Boston Globe and Foreign Policy. In addition she has co-authored four books. Three in the Netherlands and one, The Half Jewish Book, in the US (Random House). The English-language version of her latest book, Alias Fortezza, a Hacker’s Odyssey, will be published later this year by Audible. When she started her career as a foreign correspondent, the Dutch radio company who employed her, wanted her to cover the Three Mile Island meltdown. She refused the assignment because the governor had just advised all pregnant women to evacuate. She was pregnant at the time. Her contract was not renewed. Suzanne Kay, Associate Producer, is an award-winning filmmaker who co-wrote and produced Cape of Good Hope receiving numerous Best Film awards and nominations, including Honorable Mention for the People’s Choice Award at the Toronto International Film Festival, National Board of Review, and NAACP Image Awards. She began her career as Arts and Entertainment editor for Essence Magazine. After graduating from Columbia School of Journalism, she wrote news for CNN and worked at the McNeil Lehrer Report. More recently, she was a consultant for Sankofa.org, a social justice organization founded by Harry Belafonte. She is currently producing a documentary on Ed Sullivan and the important role his show played within the racial and social movement of the time.